Subject: A way to tell if a tape is written 7 track or 9 track without damage to the tape. Allen, When I first started working on 727s in 1956 the tapes were an acetate base with a red oxide coating. We used carbon tetrachloride as our cleaning fluid at that time. The branch office even had a vat in the basement shop where you could dip a whole typewriter to clean it. At that time we had a part number of a small vile of capsules containing a very fine powdered iron. When we wanted to check what was written on a tape we would put some carbon-tet in a small wide mouth jar and empty the contents of one of the capsules into it. You could put a loop of the tape in the jar and see-saw it up and down until it was coated with the solution. The carbon-tet would evaporate rapidly and the powdered iron would stick to the magnetic spots on the tape. We had a jewelers loop with a gradicule on it and we could even read the data at 200 bpi. ,p. Mainly we just wanted to look at the inter record gap. You could put Scotch tape over the powered iron and pull the pattern off and stick it on a piece of white paper for a permanent record. There were times when I would want to look at a record gap and no iron capsules were available. I would use some magnetic clutch powder and it worked good enough to measure the gap. 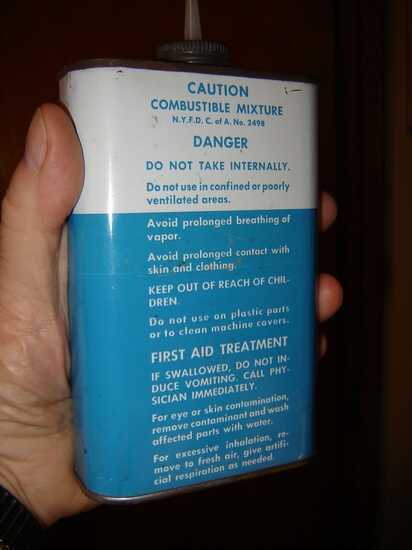 Later on the use of carbon tetrachloride became questionable so IBM switched to Trichloroethylene 1,1,1. It came in a gold colored 8 oz can and came to be known as gold can cleaner. This stuff was really a great solvent and used heavily including the liquid in our tape developer. 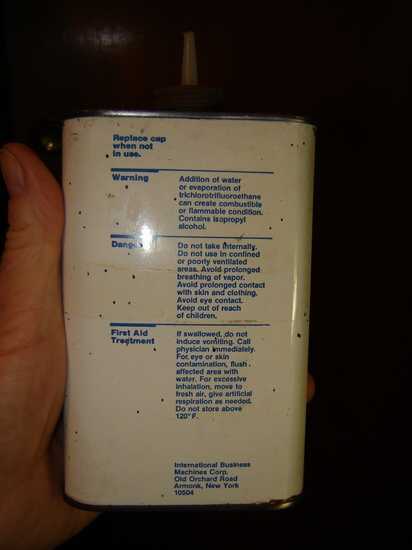 It was so good on printers they came out with a part number for a gallon can. 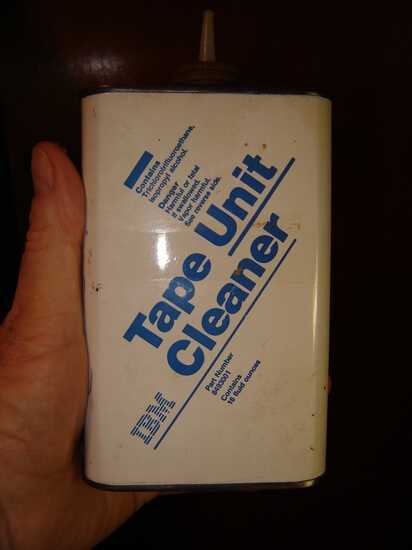 When IBM came out with the Mylar based Heavy Duty tape a friend of mine named Gene Hicken, who was a 705 Technical Specialist at Lockheed, got promoted to the Product Test Lab. at Poughkeepsie. His job was to do the test of the new tape. One of the problems with the tape in the test was if you tried to develop it the Trichloroethylene would dissolve the bonding agent and the oxide would come off the Mylar and leave you with a clear piece of Mylar. Gene solved this problem and got a patient for IBM for a device that would let you look at the bits on the tape. It was an oval shaped aluminum ring with glass on the top and something like cellophane on the bottom with developer fluid in between. You placed the tape on a flat surface oxide side up. Holding the device cellophane down you sloshed the developer around in a circle an sat it down on the tape. 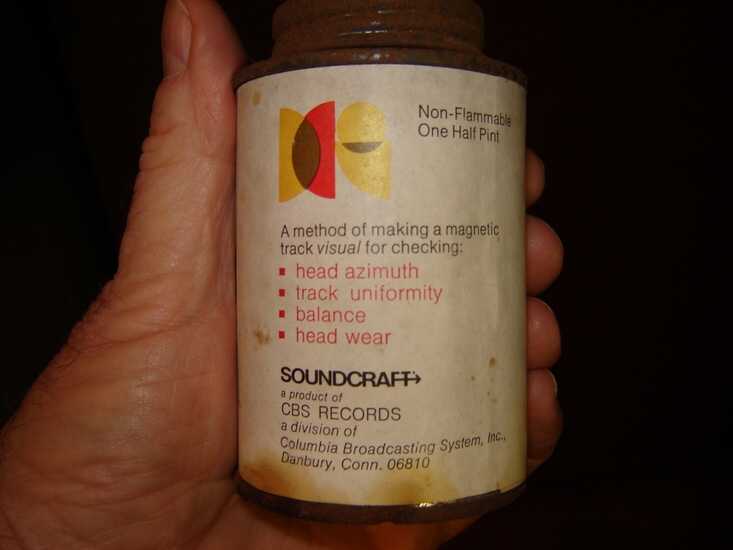 As the fluid settled down the magnetic spots on the tape would attract the powdered iron and you could see the record and bits. You could not save the evidence with Scotch tape but you also did not have to clean anything off the tape. 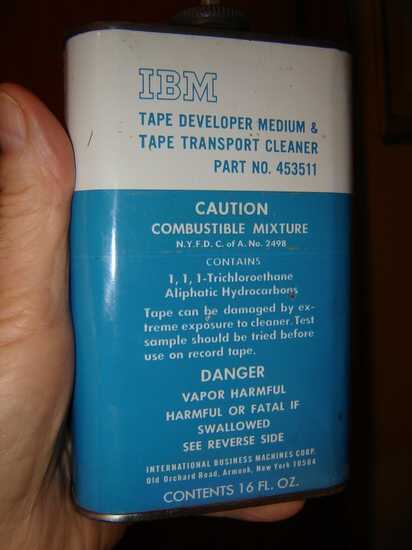 Back IBM came out with a new tape drive cleaner PN453511 but it had some Trichloroethane 1,1,1 and a warning on the can to test a sample before using it on record tapes. Back Then they went to PN 8493001 which had Trichloroethane and Isopropyl alcohol. This was the weakest cleaner we ever had. 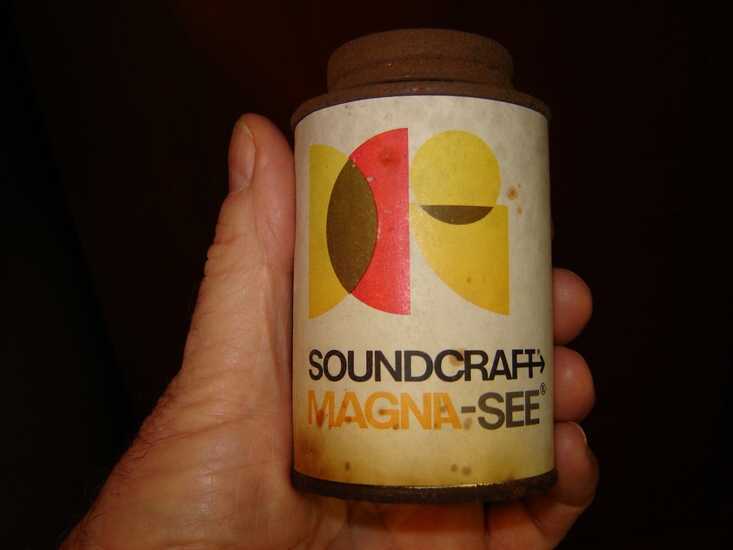 Back Finally Soundcraft came out with a commercial product called Magna-See. It worked well and all the fluid has dried up in my can but it still smell like Carbon Tetrachloride if you take the top off. 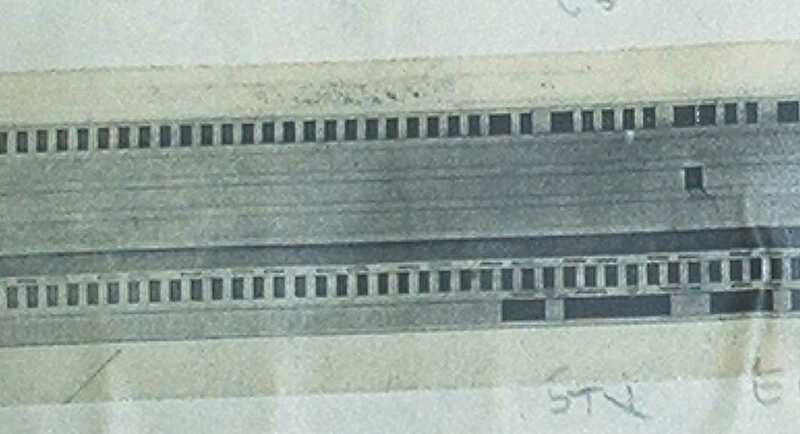 This image was developed with Magna-See and the tape was recording continuously so there is no inter record gap. You can plainly see it is a 7 track drive.